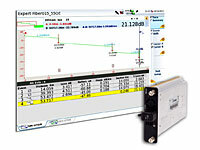 In-Service CWDM OTDR test solution to maintain and troubleshoot CWDM fiber networks. The CWDM OTDR solution helps cable operators, dark fiber providers and telecommunication service providers to characterize, maintain and troubleshoot CWDM fiber networks. The CWDM solution complements the existing range of OTDR modules within the T-BERD/MTS family and further enables user to rapidly, reliably and cost-effectively deploy network services in one convenient package.